There's been a lot of buzz around the blogosphere about an amazing initiative and event that's focusing the spotlight on our outdoor feral brothers and sisters. 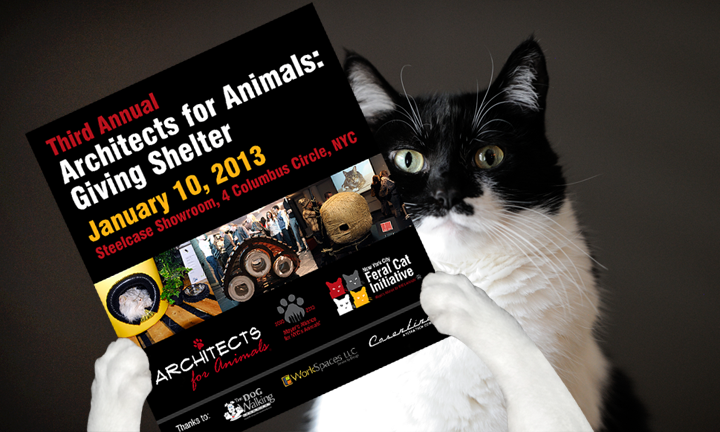 It's called Architects For Animals – Giving Shelter. This clever fundraising and awareness initiative is in its third year and benefits the Mayor's Alliance for NYC's Animals. Some of New York City's most prestigious and talented architects are designing and donating creative outdoor winter shelters to provide homeless cats with refuge from the season's frigid temperatures. At the public event, these amazing structures are on display to see, touch and marvel at. They are not only functional, but beautiful works of art. At the end of the event all the shelters will be donated to care givers that work paw in paw with the NYC Feral Cat Initiative. Tens of thousands of free roaming and homeless cats live in NYC. Many live in groups or "colonies." The winter months create particularly harsh conditions for these cats. Finding food, water and shelter can be a life or death challenge. There are literally thousands of dedicated volunteers that care for these animals, many of which are part of organizations that comprise the NYC Feral Cat Initiative. They make sure the cats in their care are spayed/neutered, vaccinated and left-eartipped to identify them as having been spayed/neutered. Every single day, these care givers provide food and water for the cats and if medical care is needed, they are there to find help. 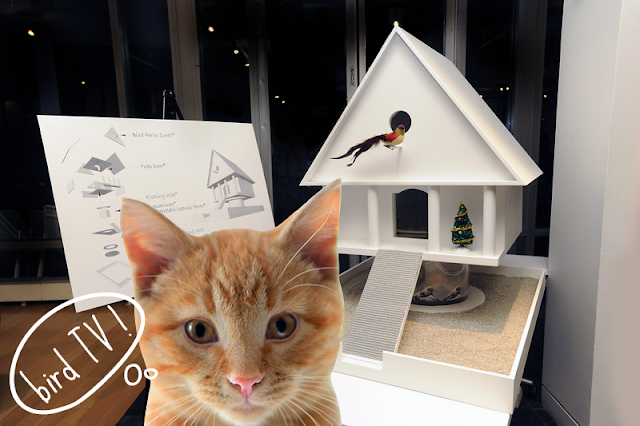 Giving Shelter is a competitive event which creates an opportunity for the architectural and design communities to showcase their talents while improving the lives of NYC's outdoor and homeless cats. If you live in the area, this is an event you won't want to miss! As much as we all love great design, our feral friends don't need anything fancy. 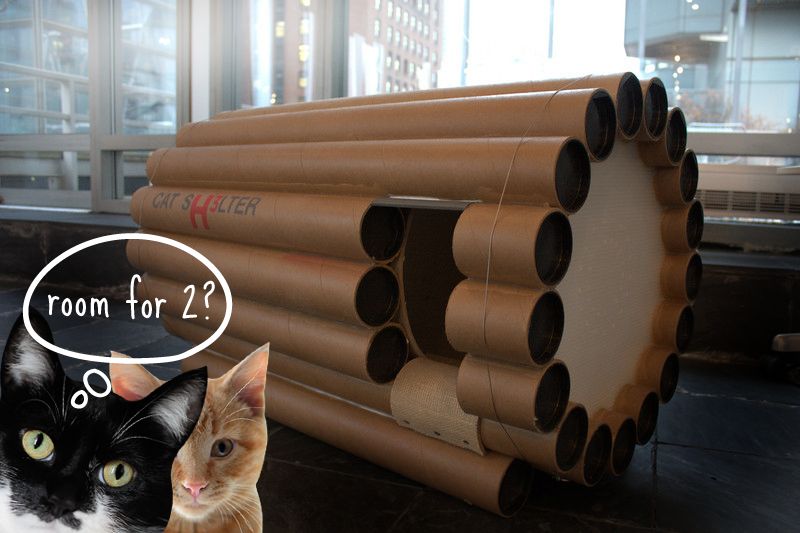 NeighborhoodCats.org has a great how-to article on building your own shelter. Not only that, our blogging friends at The Chronicles of Zee & Zoey wrote just this week about the event and linked up to a GREAT demo on making your own shelter out of a simple Rubbermaid container. We want to give a special shout out to our friend Tamar from I Have Cat for letting us know about this event and asking for help in getting the word out. You can bet she'll be there trying to crawl inside the shelters herself! That sounds like fun. Thank you for sharing stories like that. Even though I don't live in NY, it's nice to know about stuff like this. 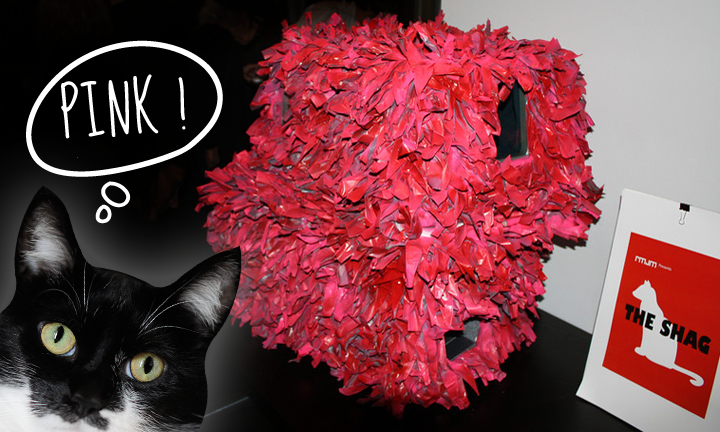 It's feral cat house mania! We also wrote about it last week and featured other cool designs. Feel free to amble over to see more photos of amazing cat houses. "we're dreaming of cat houses in Miami..."
Thanks for sharing!I just posted about the event at Cat Wisdom 101 and will be there. I'll give Tamar a hug for you. P.S. Sorry I haven't commented lately. My schedule is too tight so I'm only returning comments left at my blog. That is so cool! I like the bomb shelter themed cat shelter. That is really cool and what great structures. This sounds like such an awesome event! We love all of these houses. As you know we are fans of any event that raises awareness for our feral feline friends. Just before the holidays the group our mama works with spayed/neutered a colony for a lady who lets them live in her barn. Those are some lucky kitties. They are cool. Waffles you nailed it, bird TV. We like the pink. Great idea and we wish them well. Have a terrific Tuesday. Brad asked if you'd like to share the pink one with him. purrr....meow! That's too cool! Our mommy loves functional art! This is so cool! We just wish we lived in NYC so we could go. I just absolutely adore the one with the wooden grid on top. The tubes are pretty cool, too. Of course, the good old standby Rubbermaid shelter is good too and I'm sure the cats love just being warm and dry. Purrrrrrrrrrrrrrs. What a wonderful initiative. I wish more people understood and cared how much those animals suffer and this a a good way for more people to become informed. OMG i love this post! So well done! That is so wonderful. We are happy to hear it. It sounds just like Rome with all the homeless cats. I wouldn't be caught dead in one of those ugly houses. Yuck! I'm glad you didn't show that ball of twine house. What's wrong with ferals living in garages like the garage right here across the street from our condo? Anyway TW would love to go to the event but has no $$ and doesn't like traveling alone in NYC after dark anymore. Yeah, she's gotten THAT old. All the houses are great and we LOVE the fact the homeless cats will have somewhere warm to sleep. Hi Katie, I am going to this event, so I will let you, Waffles Too and Glogirly know all about it! I live across the river in Jersey City, and we have many feral kitties in our city. I help feed, rescue and place as many as possible but there are some kitties who are happier on the streets. These houses are purrfect for them, so my good friend Natalie (Chief Rescuer of PAD Paws) and I are going to learn more and connect with other humans who love ferals as much as we do. How wonderful that you are raising awareness about those felines on the streets, who need our love and kindness. Very excited to see all the wonderful designs! This is furry COOL ! What a wonderful show! Wish I could go. My human is gonna go. With all the newsletters she receives about what's going on in NYC, she had not heard about it until I saw it at Sparkle's blog. those Architects make some neat kitty cat shelters, how fun! This is Awesome! Feral cats need a place to stay too! That's great. What a wonderful event. Great awareness for our feral cat friends. RSVP for Architects for Animals: Giving Shelter at this link by midnight tonight or take your chances are the door tomorrow! We have seen these and think they are pretty wonderful! Mowzers, the Mayor's Alliance even posted a comment! 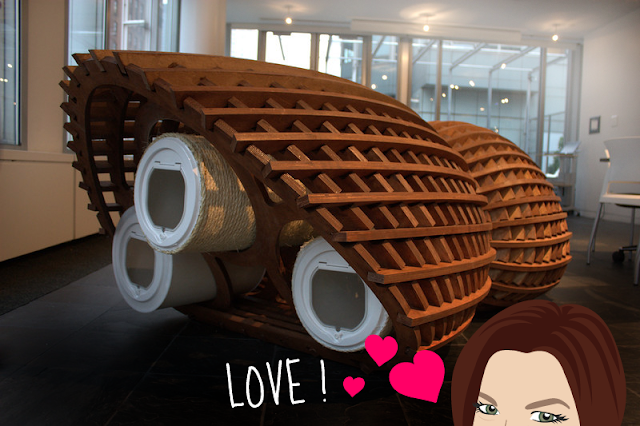 We love seeing the new stuff those architects come up with each year! We agree with CK, some of them we wouldn't be caught dead in, but others are WAY COOL!